From Drikung Dharma Surya (see letter below): They have made a beautiful book of quotes from HE Garchen Rinpoche and asked that we share with Center Directors and sangha members for free distribution. Om Tare Tuttare Ture Svaha! As you may have already known in early this year, we have completed and made a book titled, “Quotes From the Precious One”, a collection of 108 insightful quotes, inspirational sayings and heartfelt advices from our beloved Garchen Rinpoche. 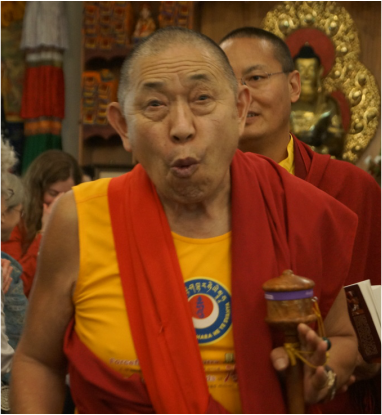 Here, we would like to share the book with you and wish that all Garchen Rinpoche’s Centers will preserve and ensure that these quotes of love and wisdom can spread far and wide with the sole wish to bring peace and happiness into the world and to benefit all sentient beings without exception. Please also kindly share the book with Directors of other Garchen Centers because I don’t have their email addresses. It is also our plan to share with Drikung Kagyu Institute (DKI) in India in the near future since I have presented and offered the book to His Holiness Drikung Kyabgon Chetsang when he visited here in Virginia. Our beloved Garchen Rinpoche loved this book very much, in particular those quotes and associated photos that have also brought to him special memories. Hope that everyone will always remember vividly and diligently follow the wonderful qualities, enlightened activities, profound teachings and direct instructions of our beloved Guru. As we speak, the book is being translated into Vietnamese language, while the Mahasiddha Garchen organization in Singapore is planning to do Chinese translation within their busy schedule with other on-going publications. If I can be of any help in any way, please do not hesitate to contact. P.O. Box 2183, Centreville, VA 20122-2183, U.S.A.